I am pleased to warmly welcome you to the Regional Department of Defense Resources Management Studies (DRESMARA), the only institution of postgraduate military education of this kind in Romania. On our website, you will find updated information regarding the Department’s agenda, news about our course offer, as well as other internal and international activities we are an active part of. 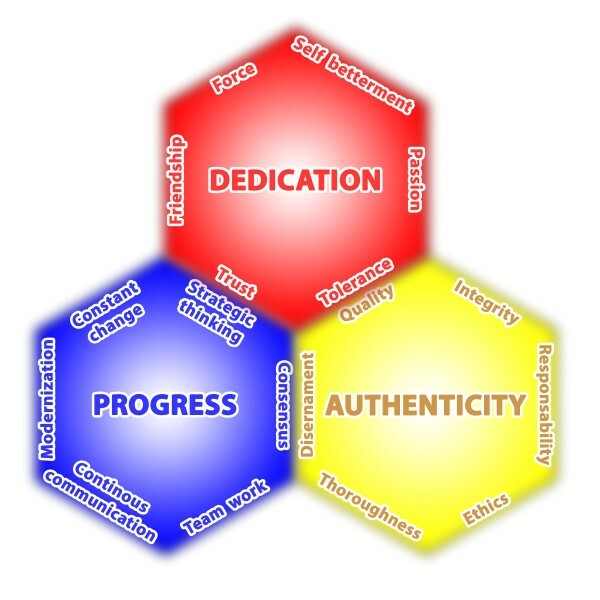 We shall do our best to provide you with relevant information, hoping that it will prove helpful to you as our students (prospective, former, or present), but also to everyone genuinely interested in military education, research, and in participating to or organizing international activities. We are delighted to invite you to participate in our courses and to benefit from our facilities, which enable the delivery of a modern and efficient educational process. Please feel free, therefore, to access our website for the latest news on these matters. We are currently in permanent contact with all the new aspects of Romanian and foreign postgraduate education. Hence, we are adapting ourselves to the challenges posed by the configuration of future military conflicts, by the changes continously occurring in our society and military system, as well as by NATO requirements. Your realistic and constructive criticism, remarks, queries, and comments will be most appreciated, if you email them to contacta at crmra.ro. The Regional Department of Defense Resources Management Studies Brasov (DRESMARA) is a higher education institution funded and supervised by the Ministry of National Defense and is subordinated to the commander (rector) of the “Carol I” National Defense University. DRESMARA is officially recognized by NATO as one of the 31 NATO-PTEC Partner Centers for Education and Training at the international level. 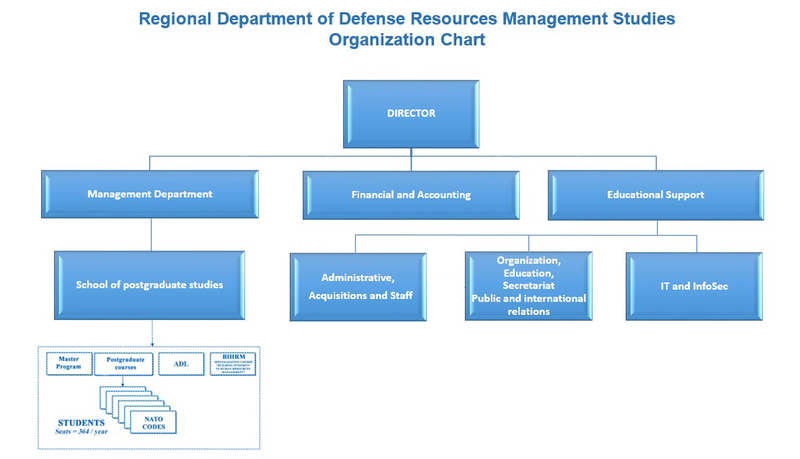 The Regional Department for Defense Resources Management Studies is recognized both nationally and internationally for EXCELENCE in providing education and DEVELOPMENT of fundamental though patterns based on integrated-adaptive and creative-intuitive models, achieved through educational programs dedicated to current and future leaders, both military and civilian with roles in the implementation of the National Security Strategy. Through the Government act Nr. 446 from 10.06.1999 the creation of the Regional Centre for Defense Resources Management (CRMRA) was decided, to function in collaboration with the Institute for Defense Resources Management of Monterey, California, USA and under the direct subordination of the Secretary of State for the Euroatlantic Integration and Defense Policies. 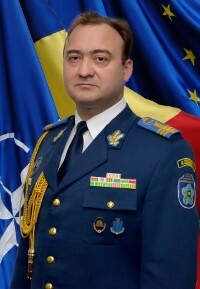 During the process of aligning with the NATO Standards, the need for an educational compatibility with other member states imposed a strategic investment from the Romanian State in this field, which materialized by the creation and development of CRMRA. In 2005, CRMRA moves from the Secretary of State for the Euroatlantic Integration and Defense Policies under the direct subordination of the “Carol I” National Defense University commander (rector). On the 3rd of May 2006, the Romanian Government issues the Decree nr. 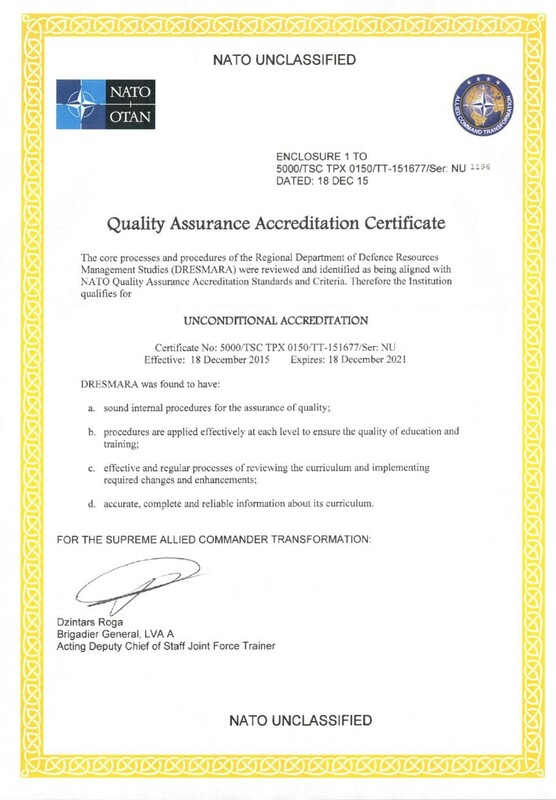 583 regarding the change of the name of the Regional Centre for Defense Resources Management (CRMRA) to The Regional Department of Defense Resources Management Studies (DRESMARA). 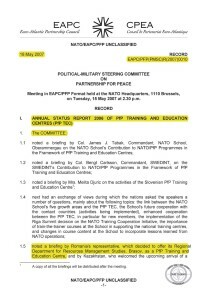 In the spring of 2007, in close relation with the political decision that Romania should actively contribute to the EAPC and the Extended Peace Partnership, the Department became a member of the NATO/PfP centers for training and education, and consequently became accredited by NATO for this purpose. Being awarded with Unconditional Accreditation for six years (2015-2021), DRESMARA will continue to strive in enhancing the institutional quality assurance of education, by implementing all recommendations included in the JFT’s evaluation report, as well as maintaining and further developing the identified Best Practices.